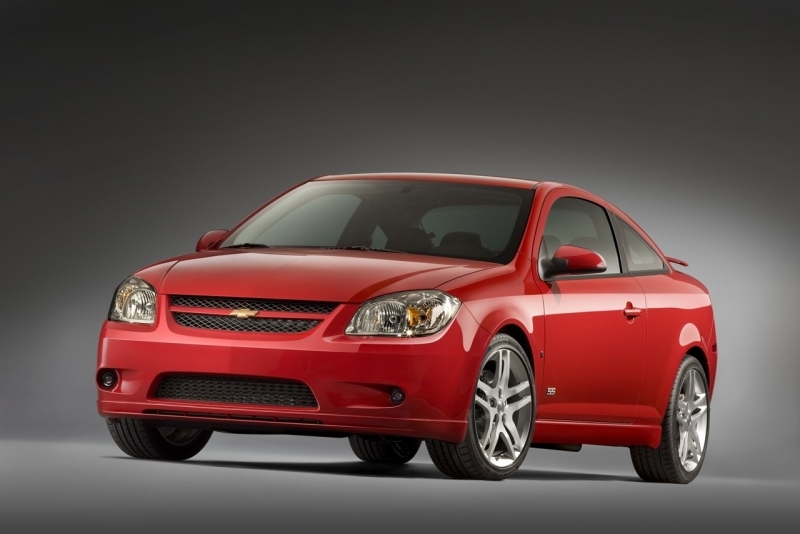 The 2008 Chevrolet Cobalt SS has been designed from the ground-up as a no-nonsense budget performance car and, for the most part, Chevy has hit its target. For a front-wheel drive car, the Cobalt SS is brutally fast on track, with ample power delivery, potent braking ability and a well-tuned performance chassis. Furthermore, common front-wheel drive issues such as torque steer and understeer have been kept to a minimum. 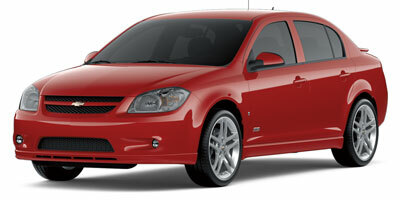 For such a track-ready performance coupe, the Cobalt SS has managed to retain all the practicality of the base model. While the new Cobalt SS's styling has not grown in leaps and bounds the way its performance has, make no mistake about it - anyone looking for brawny, aggressive small car should look no further than this. The Cobalt SS has solid turbocharged torque delivery and is nothing short of rampant above 4,000 rpm. The Brembo brakes are firm, with good pedal feel and excellent stopping power. Few options mean the base model is full of features and accessories. The Cobalt's suspension is tuned for performance, so as a result it can be stiff and crashy over uneven surfaces. Rear legroom is cramped and not very adult-friendly. Price is somewhat high compared to the import competition. The Cobalt SS has been built as a driver's car from the ground up and it shows. The high-output turbocharged engine, which receives its full 260 lb-ft of torque at a very low 2,000 rpm, pulls harder and harder as it approaches the redline. Torque steer, a common problem in fast front-wheel drive cars, has been kept to a minimum by use of electronic traction control and revised front suspension geometry. The steering is direct and accurate for an electric system, but can be slightly vague on feedback at high speed. A clever "no-lift" up shift feature keeps the turbo on boil by allowing the driver to keep the throttle pinned to the floor while moving up through the gears. 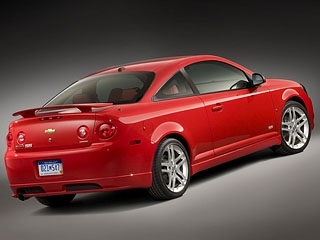 The Chevy Cobalt SS is powered by a turbocharged 2.0-liter inline four which puts 260 horsepower and 260 lb-ft of torque down through the front wheels via a 5-speed manual transmission. Currently, GM has no plans to offer an automatic transmission. The clutch is light and compliant, making it easy to get the car rolling from a standstill, but the gearbox is too soft on occasion. We'd prefer a shorter throw to go along with the track ready engine. The Cobalt SS comes standard with plenty of performance-oriented features including a superb, fade-free Brembo brake system, 18-inch forged aluminum wheels and both front and rear stability bars. Standard safety features include StabiliTrak electronic stability control and side-impact airbags. Only four options are available - a power moonroof with tilt, metallic paint, a choice of two different rear wings and a limited slip-differential. We would highly recommend the differential, especially in areas prone to rain and snow, as it helps keep the torque of the engine contained through the bends. 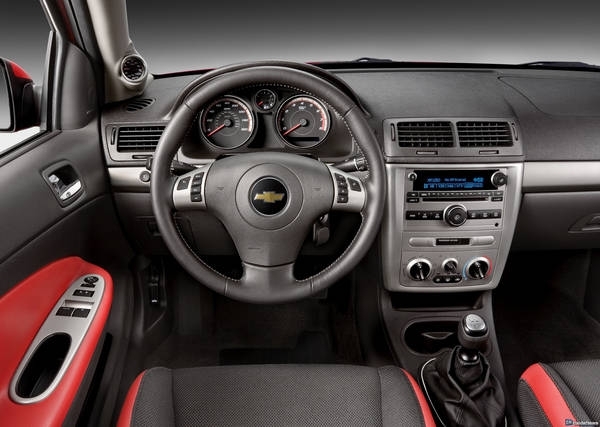 The Chevy Cobalt SS features a launch control system, which will make even a manual transmission novice look like a drag pro. Once the system is activated, the driver simply pins the throttle with the clutch in and the car takes care of the rest, dialing in the perfect revs and maximizing traction off the line once the clutch is let out. Performance geeks will also love the standard A-pillar mounted boost gauge. 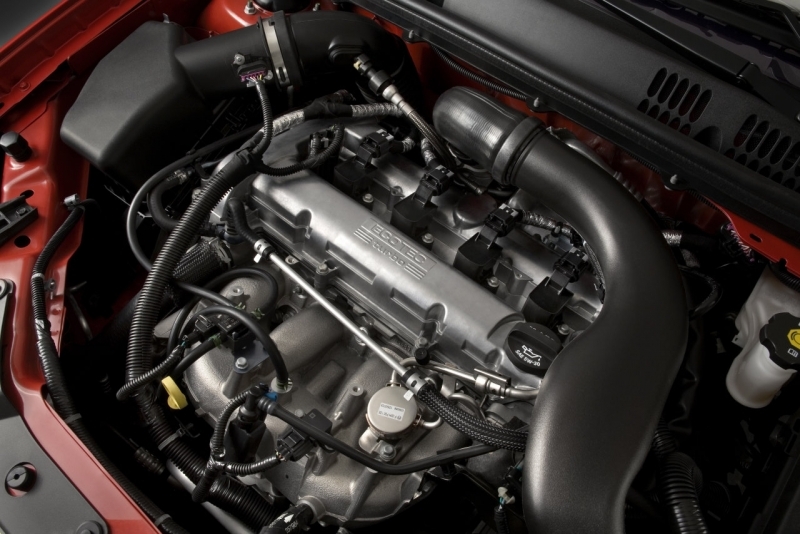 Chevy's 2.0-liter Ecotec engine delivers amazing fuel economy for a performance-oriented turbocharged engine. While it maintains high power output, its direct injection design helps it return 22 mpg in the city and an impressive 30 mpg on the highway. Even habitual lead-foot drivers will rarely see fuel economy drop below the 20s. The interior of the Cobalt SS is a huge step up from the base Cobalt. The clear, brightly illuminated gauge cluster comes across as sporty yet sophisticated. Interior accents, which partially adorn the seats and doors, can be selected in ebony, light gray or victory red. The only downside is that the performance seats, while well bolstered for track use, can cause discomfort on long rides. The Cobalt SS has an aggressive outward appearance thanks in part to the Brembo-filled 18-inch wheels it rides on. For an even sportier look, both small and large rear wings are available as an option, the latter of which generates downforce at speeds over 70 mph but causes major rearview sight issues. The Cobalt SS comes in at a base price of $22,995, putting in the same price range as the Honda Civic Si, Volkswagen GTI and MazdaSpeed3. However, Chevy has crammed the standard Cobalt SS with just about every accessory and, as a result, a fully-loaded Cobalt runs just under $25,000, undercutting its optioned-out competitors while enjoying a solid horsepower advantage. The Cobalt SS has hit its mark as a focused, fun and immensely track-capable front-driver. What it lacks in comfort and sophistication against the more put together imports, it more than makes up for with raw, brutally unapologetic performance, yet it still manages to maintain a civilized side for daily use. If you are in the market for a low-price performance car, a Cobalt SS cross-shop is well worth it.